WEST LAFAYETTE, Ind. – Future astronauts spending Thanksgiving in space may not have to forgo one of the most traditional parts of the day's feast: fresh sweet potatoes. Sweet potato plants have main vines with many shoots that branch out to the sides. Mitchell said it was common for one plant to cover the entire surface of a 15-by-5-foot greenhouse bench. "Sweet potato is like an invasive plant. It will take over everything," said Mitchell, who studies the selection of crops that could be grown in space. "That's not acceptable if you're going to grow it in space." Knowing they needed to contain the plant's horizontal spread, Mitchell and Massa decided to force it to grow vertically. Using cones or cylindrically shaped wire cages, they trained plants' main vines to wrap around the structures while removing the space-consuming side shoots. "It turns out the vines are not really picky about what you do with them," Massa said. "As long as you leave the main shoot tip alone, you can remove the side shoots and trim them away without any yield loss." The main shoot tip, or the end of the main vine, is the only really sensitive part. It sends hormones throughout the plant that stimulate root development, which is important since it is the roots that become the sweet potatoes. The side shoots, if picked when still young, are tender and can be eaten in salads, improving the plant's usefulness, Mitchell said. On Earth, scientists might want to find ways to get crops to take up less area, focusing on only two dimensions. A tall, skinny corn stalk, for instance, takes up little space in a farm field. In space, however, that third dimension - height - is important because plants may need to be stacked to use all available space. Using a cone or cylinder is what might make sweet potato a viable space crop. Since the area inside the cages is empty, astronauts could put other plants inside and keep them alive with LED lighting. The sweet potato plants also weren't particular about lighting or temperature. Mitchell and Massa grew sweet potatoes in greenhouses during different seasons and saw no difference in yield. "Sweet potato doesn't seem to care what season it is or what conditions it's in," Mitchell said. Massa said that's important because many different types of crops may have to be grown in the same rooms in space. Picky plants won't fare well with other picky plants having temperature or lighting requirements much different from their own. "We call it a generalized-growth environment," Massa said. "We're finding the optimum, not the maximum." Mitchell and Massa said they'd next like to study LED lighting's effect on sweet potato and other crops. NASA funded their research. Sweet potato (Ipomea batatas L.) "Whatley-Loretan" was developed for space life support by researchers at Tuskegee University for its highly productive, nutritious storage roots. This promising candidate space life-support crop has a sprawling habit and aggressive growth rate in favorable environments that demands substantial growing area. Shoot pruning is not a viable option for vine control because removal of the main shoot apex drastically inhibits storage-root initiation and development, and chemical growth retardants typically are not cleared for use with food crops. As part of a large effort by the NASA Specialized Center of Research and Training in Advanced Life Support to reduce equivalent system mass (ESM) for food production in space, the dilemma of vine management for sweet potato was addressed in effort to conserve growth area without compromising root yield. Root yields from unbranched vines trained spirally around wire frames configured either in the shapes of cones or cylinders were similar to those from vines trained horizontally along the bench, but occupying only a small fraction of the bench area. This finding indicates that sweet potato is highly adaptable to a variety of vine-training architectures. Planting a second plant in the growth container and training the two vines in opposite directions around frames enhanced root yield and number, but had little effect on average length of each vine or bench area occupied. Once again, root yields were similar for both configurations of wire support frames. The 3- to 4-month crop-production cycles for sweet potato in the greenhouse spanned all seasons of multiple years during the course of the study, and although electric lighting was used for photoperiod control and to supplement photosynthetic light during low-light seasons, there still were differences in total light available across seasons. 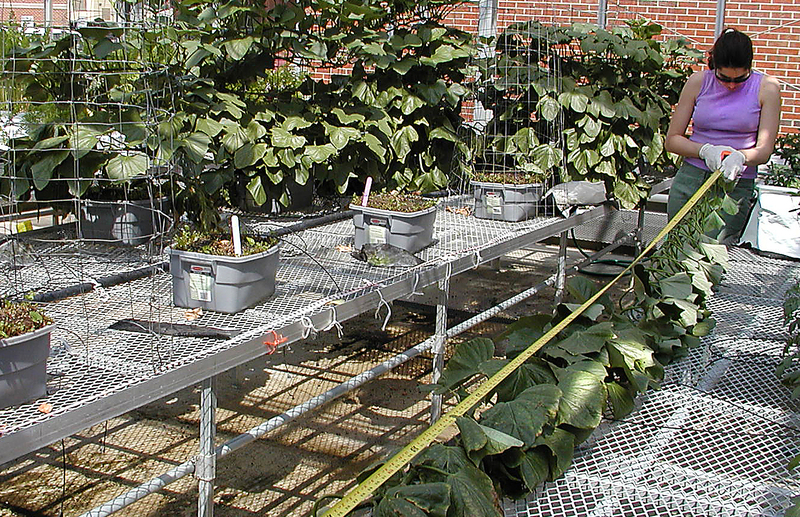 Light variations and other environmental differences among experiments in the greenhouse had more effects on vine length than on root yield. Average vine length correlated positively with total hours of daylight received across seasons, and responses for one plant per container were higher above a threshold duration of solar exposure, suggesting that the vines of two plants per container compete for available light. In addition to the adaptability of sweet potato to various vine-training architectures and across seasons in terms of maintaining root productivity, the open, interior volumes of the support frames tested in this study will provide future opportunity to enhance sweet potato root yield in space by adding novel interior lighting, such as from intracanopy arrays of light-emitting diodes. This work was sponsored by NASA grant NAG 5 1286.